With our new picture book, The Magical Midnight Rescue, Marla and I have made presentations to the Raising Readers, in Callander, Ontario, and schools in Emsdale and South River. The students created gorgeous carousel horses. ​This page is for student work. ​In this picture of the folded paper wagon, cucumber slices are used for wheels. Setting, story maps and character drawings, showcase activities for the chapter book, The Paper Wagon. 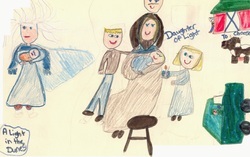 Alicia created this poster after reading, 'Daughter of Light'. ​ want to make a paper wagon."